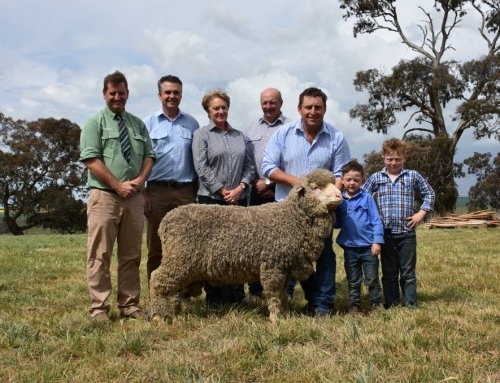 MERINO enthusiasts flocked to the Corkhill families annual Merino and Poll Merino ram sale on Monday, chasing the passion and enthusiasm that stud principal Michael Corkhill puts into his breeding program and the rams he offered. This demand saw 94 of 96 rams sell to a top of $4500 and average $1981, with all 43 Poll rams topping at $4000, averaging $2268, while 51 of 53 Merino rams topped the sale at $4500, averaging $1716. Stud classer Craig Wilson, Craig Wilson Livestock, Wagga Wagga, re-interated these sentiments from buyers saying the sale reflected the enthusiasm and committment Michael had for the industry. “People see the commitment to the future in his sheep and the high investment in his program to offer the best genetics available for his clients,” he said. He said they had made a significant Artificial Insemination investment this year Artificial Inseminating 600 ewes to what they regarded as the best genetics in the industry, resulting in 120 percent lambings. The top ram was a horned ram, who was recently awarded the champion fine wool all purpose ram at the Australian Sheep and Wool show, Bendigo, in July. He was 123 kilograms, with a 43 square millimetre Eye Muscle Area and six millimetre fats, coupled with a 18.8 micron fleece, 2.4 standard deviation, 12.8 coefficient variation and 99.9 comfort factor by the One Oak 104 sire. The ram was bought by Peter Campbell for his brother Sandy Campbell and his wife Jane, Kullingrah Merino stud, Frogmore, for $4500. Mr Campbell said they liked the fact he was the highest EMA ram in the sale, with the largest fleece weight and will fit into our stud well, as the rams we have bought from the Grassy Creek stud in the past. 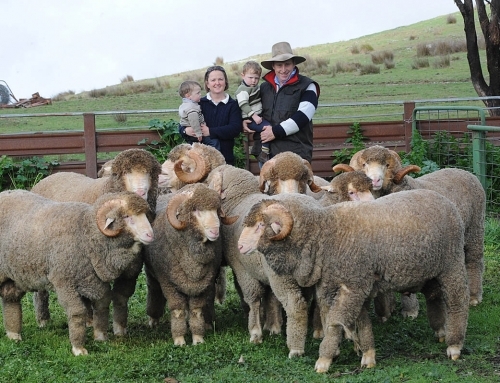 Garry and Kaye Davidson, Walpa, Victoria, paid $4000 for the top Poll ram in a draft of five rams, including two polls and three horned rams, averaging $2400. The top ram was a son of the Henry sire, weighing 87kg, with a 34mm EMA, four millimetre fats, 16.3 micron, 2.4 SD, 15.2 CV and 99.3 CF. Mr Davidson who join 3800 ewes bought at the Corkhills sale for the first time last year said the rams they bought last year have done exceptionally well and they fit in extremely well with the nice, stylish, white wool Middle View blood ewes our flock are based on. “The bloke who does our muelsing said the lambs had a good soft skin, so we hope they will fit in with our flock nicely,” he said. 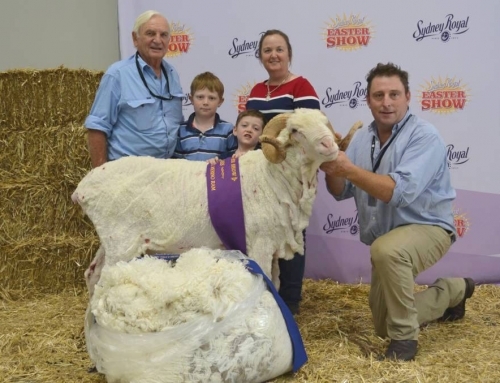 The new competition from Victoria didnt stop there with SR and MC Beasley, Lindenow South, Vic, paying to $3750 for 96kg son of Nerstane 879, at 15.4 micron, with a 2.2 SD, 14.1 CV and 99.8 CF.Bill Swan, “Coppa Canyon”, Bookham, set a solid floor in the market buying six Poll rams and two horned rams to a top of $3750 to average $2500 to join with his 3500 ewes. Mr Swan has bought at Grassy Creek for five years and said the rams he buys suit his sheep and country well. “The rams are big framed, soft handling rams, with nice, bright, soft fleeces, that give you fine wool sheep with great weight,” he said. New clients to Grassy Creek Craig Goodwin (manager) and Chris Komor, “Willow Bend Station”, Boorowa, bought nine horned rams for $1417. 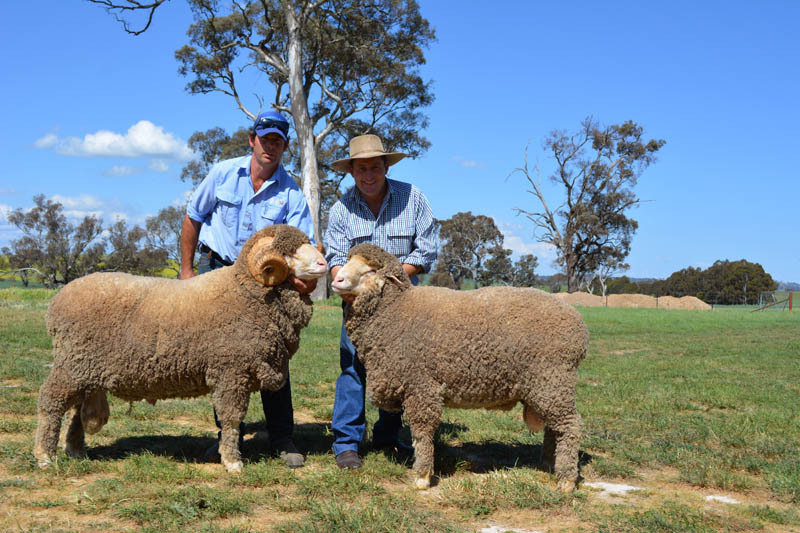 Mr Komor said they have been based on Hazeldean bloodlines for 70 years and will continue to base their flock on Hazeldean genetics, but the Grassy Creek sheep will compliment our flock and add a new dimension to our genetic base. “We were interested in fleece weight and rams that could pump out a lot of it, combined with growth rates that can produce faster growing dual purpose lambs to tick all boxes for wool, meat and carcase,” he said. Mr Komor said they were in the business of producing wool and meat and he was blown away with the attention to detail in the figures of the rams and the service we get from Michael. “We are still 100 per cent committed to Hazeldean, but believe the Grassy Creek sheep are closely aligned in principle and will offer a bit of extra carcase to our sheep, while maintaining quality wool,” he said. Ashley Corkhill, “Normanhurst”, Boorowa, averaged $2300 for four Polls and one horned ram, with an emphasis on soft free wool types, with good EMA and fats, which were good for producing wethers, we aim to turn off at 10 to 11 months, weighing 55 to 60kg. Other strong buyers included Maginess Brothers, “Bigga Station”, Bigga, securing two Poll and Three horned rams at $2000, BT and SJ Edwards, “Mangoplah”, Eucareena, averaged two outstanding Poll sires at $3250, while Danebank Engineering, Yass, loaded four top Polls at $2875, L Chatman and Partners, “Glencoe”, Mandagery, purchased three Polls at $2667 and GR and LM Southwell, “Wattle Grove”, Rye Park, went home with three horned rams and one poll ram for $1875. Not all rams were expensive with several buyers taking home rams under the average, with Chris Glover, “Moondarra”, Binnalong, loading six horned rams at $1383, while Phils River Grazing, “Phils River”, Crookwell, averaged $1300 for five horned rams and DC and M Pate, “Brooklyn”, Yass, purchased four Poll rams at $1250. The sale was conducted by Landmark with Rick Power as the auctioneer.